Hematocrit test devices are type of in vitro diagnostic devices. These devices are computerized and specialized machines used for counting and characterizing white blood cells, platelets, and red blood cells. New generation hematocrit test devices are bench top and have micro sampling autoloaders with continuous loading capability. Additionally, these are equipped with barcode tracking technology. Moreover, point-of-care hematocrit test meter is a wireless instrument that operates on a single-use cartridge. Normal blood analyzers can complete blood count analysis with three-level WBC differentiation. The three major physical technologies used in blood analyzers are electrical impedance, flow cytometry, and fluorescent flow cytometry. The device has gained popularity, as it helps in effective evaluation of hematocrit value compared to manual method for evaluation of hematocrit parameter. Rise in blood-related diseases among the geriatric population is likely to drive the global hematocrit test devices market in the near future. The global hematocrit test devices market is characterized by increase in incidence of chronic disease induced anemia across the world. The market is witnessing gradual rise in technological advancement supported by government funding and initiatives. The global hematocrit test devices market is projected to expand at steady pace from 2018 to 2026. Increase in the geriatric population which is prone to blood borne diseases, large patient base in developing countries demanding proper treatment and diagnosis, and investments by public and private market players in R&D on hematocrit test devices for diagnostic testing of blood and treatment of hematology originated diseases drive the global hematocrit test devices market. However, lengthy regulatory approval procedure, significant investment required in innovation of diagnostic devices and solutions, and lack of awareness about importance of hematocrit tests in the diagnosis of diseases are likely to restrain the global market during the forecast period. Hematocrit test devices are gaining popularity among health care professionals, as these have proven to be effective in producing accurate complete blood count result which help health care professional in the treatment and diagnosis of blood borne diseases. Use of hematocrit test devices reduces the inaccurate evaluation of hematocrit value using manual calculation and are found to be more effective in complete blood count test than laboratory based manual procedures. Investment in innovation in hematocrit test meters or analyzers and partnerships for co-development and commercialization of hematocrit test devices are expected to fuel the growth of the global hematocrit test devices market in the near future. In terms of product, the global hematocrit test devices market has been classified into blood analyzers, hematocrit test meters, and others. The others segment comprises consumables and accessories of hematocrit test devices. The blood analyzers segment includes hematology analyzers and blood gas systems. The blood analyzers segment is projected to dominate the market during the forecast period. Growth of the segment can be attributed to increase in usage of blood analyzers for various tests such as white blood cell count, reticulocytes analysis, and coagulation test complete blood count test, as these devices are easy to use, provide high level of precision and accuracy for red blood cell counting for evaluation of hematocrit parameters of individuals. Moreover, presence of key companies such as Sysmex Corporation and F. Hoffmann-La Roche Ltd. engaged in research & development and manufacture of innovative blood analyzers boosts the growth of the global market. Furthermore, initiatives taken by public and private organizations are aimed at installing new generation blood analyzers to provide better healthcare facilities and patient care. The relatively stable growth rate of the segment can be ascribed to high replacement rate and limited pipeline of blood analyzers. The hematocrit test meters segment is anticipated to expand at an above average growth rate during the forecast period despite the predominant use of blood analyzers in hematology testing. Preference for hematocrit test meters for hematocrit testing has increased among physicians and other end-users, as these are point-of-care devices and have the potential to provide decentralized patient care and hematocrit test at bedside and faster results than blood analyzers. Additionally, launch of products by Abbott, Nova Biomedical, and EKF Diagnostics are likely to drive the hematocrit test meters segment during the forecast period. Based on end-user, the global hematocrit test devices market has been classified into hospitals & ambulatory surgical centers, clinics, diagnostic & pathology labs, and others. The hospitals and ambulatory surgical centers segment is expected to dominate the global hematocrit test devices market during the forecast period. In terms of region, the global hematocrit test devices market has been segmented into North America, Europe, Asia Pacific, Latin America, and Middle East & Africa. North America accounted for major share of the global hematocrit test devices market in 2017. Europe was another major market for hematocrit test devices in 2017. Developed health care infrastructure and relatively high paying capacity of patients in North America and Europe compared to the developing countries provide assured business growth to new market entrants, which contributed to the high market share of these two regions. High growth rate of the diagnostic industry in India and China and investment made by global companies in China for establishment of sales subsidiaries for providing support and services to customers and to attract new potential customers are expected to propel the hematocrit test devices market in Asia Pacific. Major players operating in the global hematocrit test devices market include Nihon Kohden Corporation, F. Hoffmann-La Roche Ltd, Danaher Corporation, Siemens Healthineers (Siemens AG), EKF Diagnostics Holdings plc, Sysmex Corporation, Nova Biomedical, Abbott Laboratories, HORIBA, Ltd., and Boule Diagnostics. This report studies the current as well as future prospects of the global hematocrit test devices market. Stakeholders of this report include companies and intermediaries engaged in the manufacture, commercialization, and provision of hematocrit test devices and new players planning to enter the market. The report comprises an elaborate executive summary, along with a market snapshot, providing overall information on various segments considered in the scope of the study. The section also provides information and data analysis of the global hematocrit test devices market in terms of product, end-user, and region. The global hematocrit test devices market has been segmented based on product, end-user and region. In terms of product, the global market has been classified into blood analyzers, hematocrit test meter, and others. The others segment comprises reagents and accessories. Based on end-user, the global hematocrit test devices market has been segmented into hospitals & ambulatory surgical centers, clinics, diagnostic & pathology labs, and others. The hospitals & ambulatory surgical centers segment is expected to dominate the global hematocrit test devices market during the forecast period. Bottom-up approach has been employed for determining the size of the global hematocrit test devices market, using various market indicators obtained from secondary sources, which include analysis of launched products and mapping of sale of hematocrit test devices of top market players in specific regions. Top-down approach has been used to derive the market size of different product segments, wherein revenue of all publicly listed market players was obtained through secondary sources and analyzed for sales by narrowing down to revenue percentage for product segment through extensive analysis of annual reports, investor presentations, press releases, primary interviews, and others. Data triangulation is based on both secondary research (top-down and bottom-up approaches) and primary research. Moreover, historical year-on-year growth has been taken into consideration while estimating the market size. Market size and forecast, in terms of US$ Mn, for each segment has been provided for the period from 2016 to 2026. The report also provides compound annual growth rate (CAGR) in percentage for each segment for the forecast period from 2018 to 2026, considering 2017 as the base year. 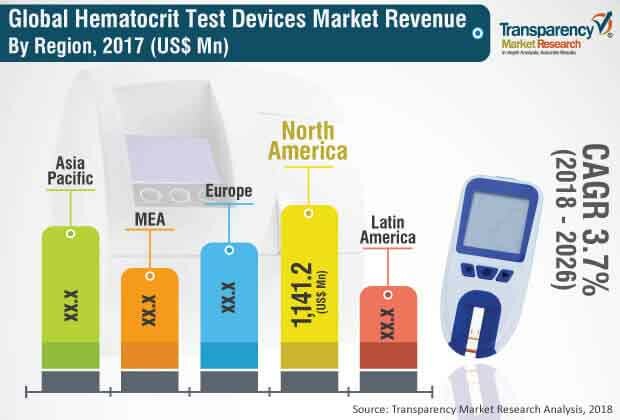 The overview section of the report explores market dynamics such as drivers, restraints, opportunities, and key trends that have significant impact on the global hematocrit test devices market and may influence it in the near future. Market attractiveness analysis has been provided to explain the intensity of competition in the market across regions. Competitive scenario existing among the market players has been evaluated through market share analysis in the competitive landscape section of the report. These analyses are likely to help market players take strategic decisions to strengthen their positions and grow their share in the global hematocrit test devices market. The report also comprises major mergers & acquisitions, reimbursement scenario by region/global market, epidemiological overview of blood related disease diseases, and key launches & approvals. In terms of region, the global hematocrit test devices market has been segmented into North America, Europe, Asia Pacific, Latin America, and Middle East & Africa. Market size and forecast for each of these regions have been provided for the period from 2016 to 2026, along with their respective CAGR for the forecast period from 2018 to 2026, considering 2017 as the base year. The report also provides market size and forecast for major countries in the above mentioned regions. A detailed qualitative analysis of factors responsible for driving and restraining the market and growth opportunities has been provided in the overview section. Competitive landscape section of the report provides analysis of market share of key players, thereby presenting a thorough analysis of the overall competitive scenario in the global drug eluting balloon market. Major players operating in the global hematocrit test devices market are Nihon Kohden Corporation, F. Hoffmann-La Roche Ltd, Danaher Corporation, Siemens Healthineers, EKF Diagnostics Holdings plc, Sysmex Corporation, Nova Biomedical, Abbott Laboratories, HORIBA, Ltd., and Boule Diagnostics.